i wanna thank mike for helping me get this bass to refurbish. this is the next refurb job. downside ... as discussed between us ... this isnt the model b.c. rich that is long enuff to put a kahler trem on. this thing has been unprofessionally owned for a while. just looking at the patch jobs, poor setups and mickey mouse dumb sh#* done to this bass makes me cry. but i dont care. 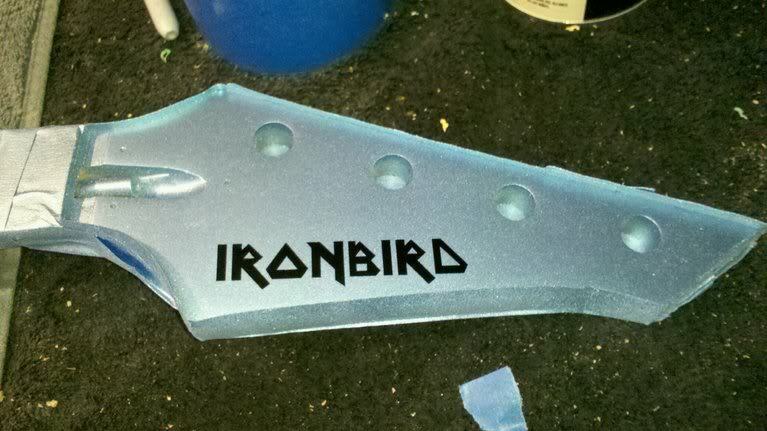 its an ironbird. looking for suggestions for what to do with this bass. remember, i havent even gotten the paint off yet, so i dont know whats underneath. if the wood is nice (or even just not ply) i'm thinking about just staining and lacquering it. trying to keep it away from that whole 80's hair metal look. the only other thing was i was thinking about doing it with a music man HH setup. never had one so i dont know the pros and cons of it, but i do know that i'm really sick of split p configurations. this was not made in n.j. i never understood that whole n.j. thing with b.c. rich ... they are out of CA and their cheap models are made in china. yes, that is a dimarzio model p. lots of attack. what the heck is this thing??? hey! thats not factory b.c. rich! allright ... you gotta be kidding me!!!!!!!!!! when i got this thing, i was trying to do a set up on it and it just kept ending up way off. i took it apart and found two stacked jigsaw blades shimming up the back of the neck pocket ... this is like almost 1/8" .... thats crazy! listen ... when i have to shim up a neck its usually only a layer or two of cardboard (like from a box of playing cards) 1/32" or less (2 layers) at max. this will usually move the nut 1/16" to 1/8" forward or backward on the playing plane as necessary. the cardboard seems to not kill the sustain and it has some give, so it, and the neck, stays put when smooshed in the pocket. if i gotta go more than that i feel like i'm gonna loose some integrity of the neck (sustain or its just gonna wobble around). i start looking at re facing the neck pocket because something is definitely wrong. major pain. if you gotta start shimming up a neck more than that or start sticking stuff in there like jigsaw blades ... STOP. don't be such a cheap lamo and find your nearest half decent luthier if the bass is worth it. you dont know what your doing, eventually this will destroy a bass, and then someone like me might end up with it and get real sore (as if you cared, being someone who does things like this to basses). at the very least, ask someone who knows what they are talking about. if you feel the need to go this far and you suspect that youre in over your head ... you are. a factory like b.c. rich would not produce something that you would need to make such an extreme adjustment to from machined factory finish to machined factory finish .... you are doing something wrong or something else is broken (dont break it even more). i put it back together again without the shims (jigsaw blades) and the strings are about .75" away from the 12th fret ... great. come to discover the truss nut was only cranked about 3 or 4 threads on the truss (with relief) ... crap. i got about a dozen turns on it untill it started to yield some resistance (before there was tension on the truss so it could do what it supposed to). put a few more turns on it and put the bass back together again ... no change. took it apart again and put another 12 turns on the truss nut till it reached the end of its travel (the nut when cranked will actually backspin when the torque is taken off because its not screwing down ... it twisting the rod). even put some moisture down in there (to soften the wood a bit). let it sit for 24 hours. started to compensate for the shim job with facing a more obtuse angle on the neck pocket. put it all back together again this morning and ..........no change. i suspect that this has neck bow. not like a twist where you can look down the neck and see it. more like the neck it warped and permanently bent forward. with running the truss nut from one end to the other with no change, i wonder if the truss is even seated correctly (broken) because obviously with the shim job, someone who didnt know what they were doing was working on this bass, made it even worse and shimmed it up and called it repaired. the forward bow is probably out of the range of where the truss would create any pull on the wood. jimi hendrix monterey festival bass tribute? put it next to my garden gnome as lawn art? furreal, i'm gonna go to music stores and see if cheap b.c. 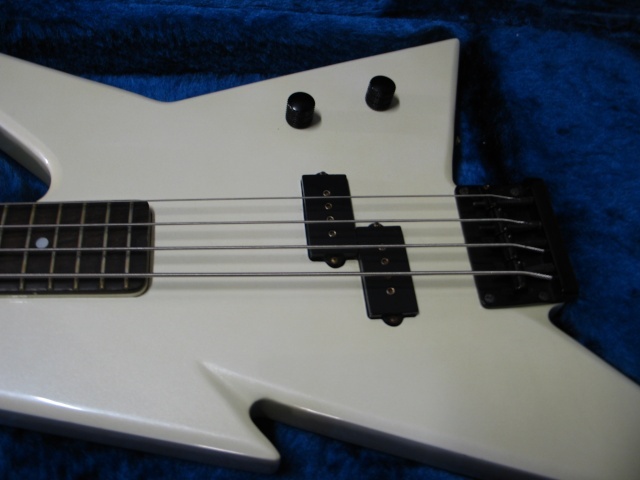 rich black widow or any of their other cheap models have a neck with the same dimensions that might make buying it and swapping with this bass worth it. crap, i spent $275 for a warmoth neck for a cheap ply p bass ... oh yeah ... not using that right now .... i gotta go measure. 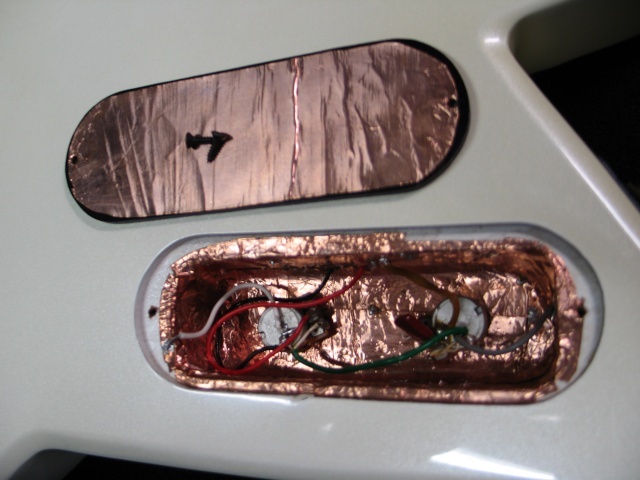 at the very least, at least i got a nice dimarzio out of it. MadMike, you might still be able to save that neck, even if it has a warp in it. I've heard of a technique that involves clamping the neck and steaming it for several hours to get it to loosen up and bend back into shape. I don't have too many other details about how exactly this is done, but that's the word I've gotten. 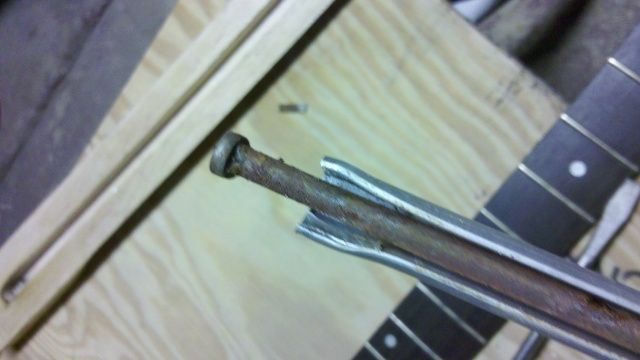 Or you could peel off the fretboard, and replace the truss rod with a better one? 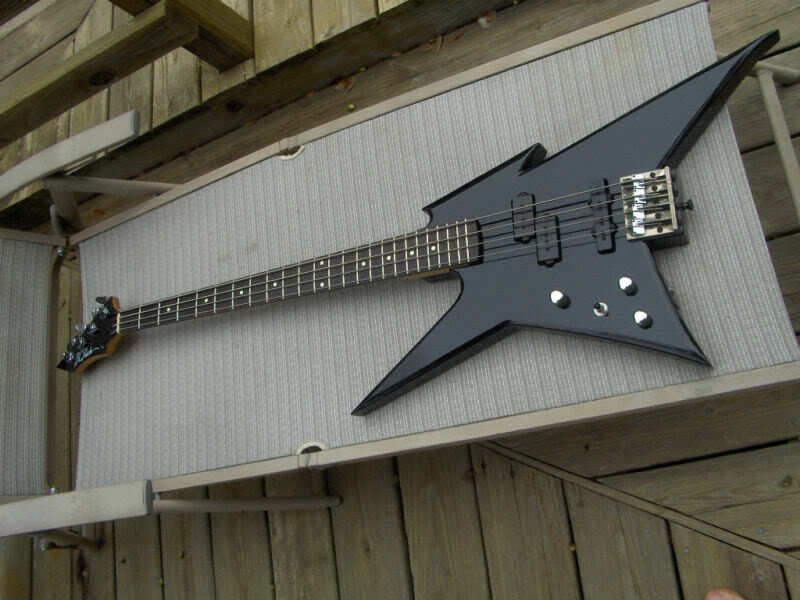 At any rate, it's a really cool bass, and I would hate to see it relegated to gnome lawn art. yeah, i did some research eric. i started at b.c. rich. they have changed hands and moved plants so many times that they have no idea what i have or how it was built except for the fact that, yes, it is an ironbird. i described how the truss is set in this neck (that its not dual action and not providing motion either direction) and he had no idea. short of buying a new bass with a similar neck (black widow) theres no way he could affirm that neck to fit on the bird and that b.c. rich is not in business to stock necks from all the different specs they have had over the last 25 years. they arent in business to help me fix my discontinued bass ... they are in business to sell new ones. b.c. 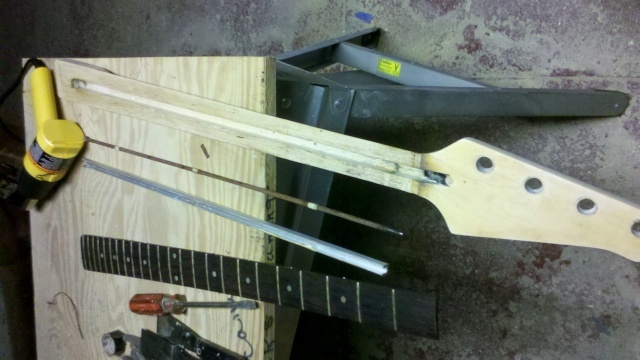 rich recommended that i find a luthier with a "neck press". good concept. wish i had one. wouldnt have fixed the problem i'm having with this neck. junk. chek out the rust and crud. and the cheap aluminum channel the truss resists in. ouch! with the channel spread and the t of the truss jammed up in the shaft, it cant create any bow (except for the position its wedged into) and this truss in non functional. like i said above ... hit resistance, STOP TURNING! ill post some pictures of the repairs and the new truss this afternoon. 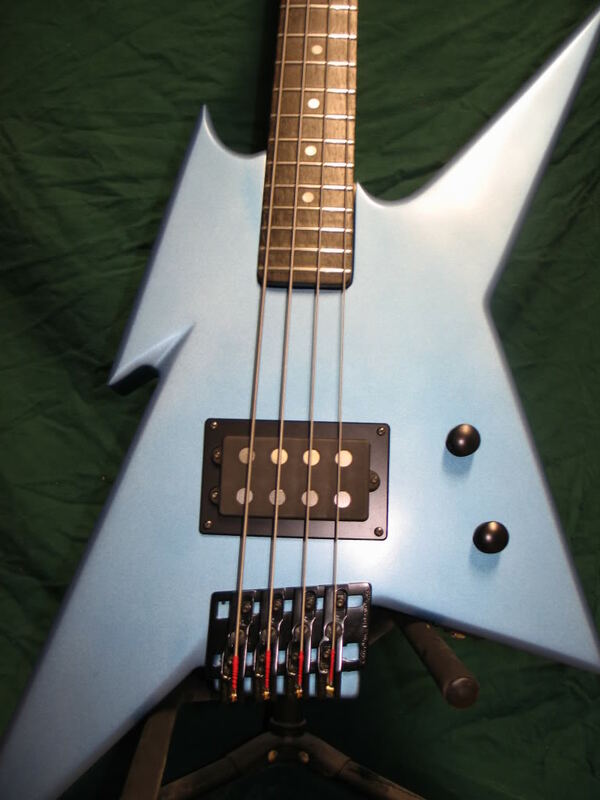 so yeah, the bc rich original truss is weird. all the different truss systems i've seen (before and doing research on the web) i'd never seen one like this. its a press in aluminum U channel with teeth on the outside (to hold it in the neck groove i guess). 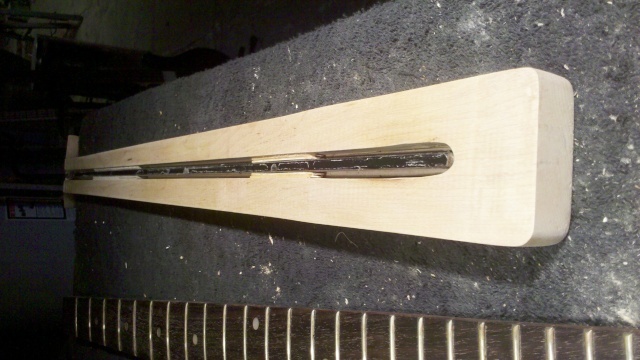 the truss rod itself, with the t end sticks out the end by the body and stops when it hits the end of the channel. the other end had a brass shim stop plate on the end of the U and a teflon ring to self lubricate between the plate and the nut. now i know that metal is mailable and ductile ... but this aluminum channel is pretty rigid. i can grab it and put a bend in it, as if there was tension on the rod and it bent the channel and neck to provide relief, but the U is 270 degrees (3 of the 4 sides) and the 90 degree angles dont seem to be the best design for the job it needs to do. bending any more than .3" relief on the neck would seem to make this want to buckle. 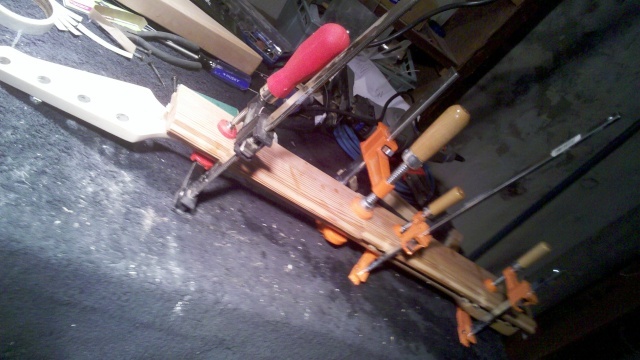 ok ... it gets stability from being wedged in the neck groove but the force needed to be generated by the truss rod (.125" dia by the way) to provide any relief is tremendous. 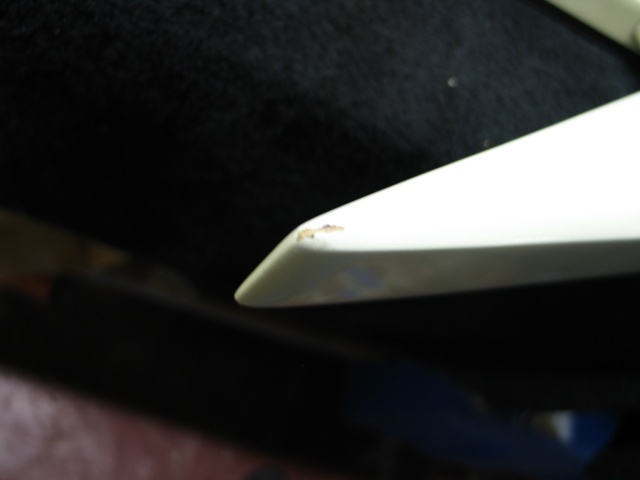 once some rust developed on the rod at the t and provided some "rampage" its no wonder it failed and slid up the channel. further research has shown me that this design is similar to the martin system. was curious and my ibanez edb600 was sitting, stripped down, beaten up, not used and weighing on my conscious ... i wanted to see if it can live on fulfilling some continued good. 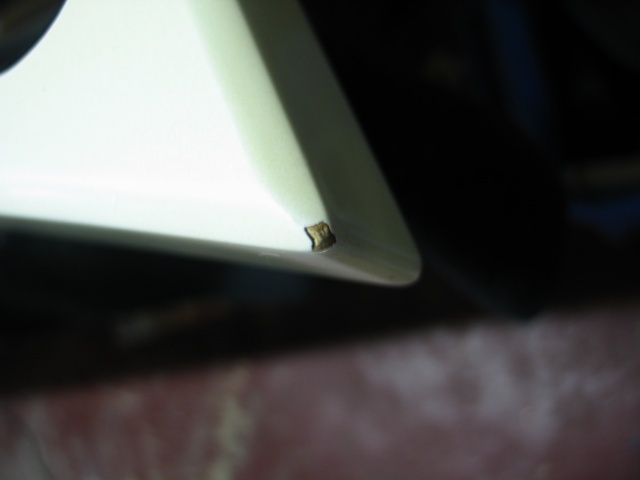 i heat gunned the fretboard off and pulled its truss. different size ... but a much better truss rod design than most i've seen. not rusted and still moves smoothly. i made it work. 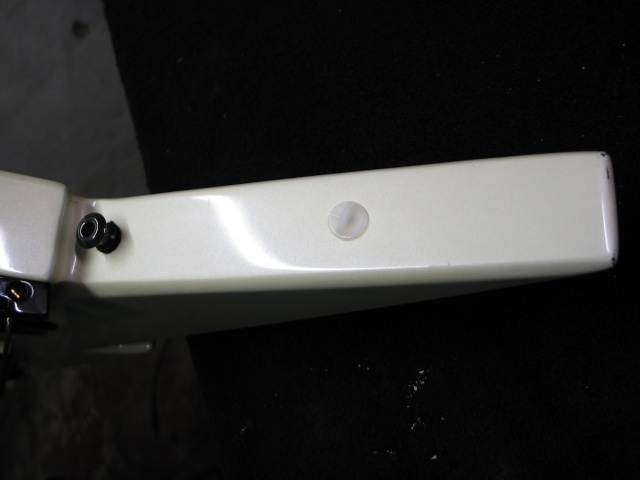 i seated the rod so the feet (body and headstock ends where it pushes back to make the bow) have a shim to push on and so the spine sits flush with the fretboard down the length ... no wiggle, no wobble, no rattle. what a messy job that was! until wood glue sets up, it sorta acts like a lubricant ... or more like a viscous surface for the fretboard to hydroplane on. i kept shifting it back and forth side to side as i was clamping it down and it didnt want to stay put. in the meantime all the glue was spooging out the sides. seems funny now in hindsight ... but not when i was doing it. i just accepted the fact that it wasnt, nor did it need to be perfect ... as long as it was seated flat against the neck surface and close to lined up with the sides of the neck. yes ... they are popsicle sticks sticking out the side ... you can't clamp it flush directly to the frets; you'll get voids between them under the fretboard. i took the clamps off about an hour ago ... nice! i started sanding the glue lines and drips and the edges that werent lined up. only took about 10 minutes with some 80 grit. 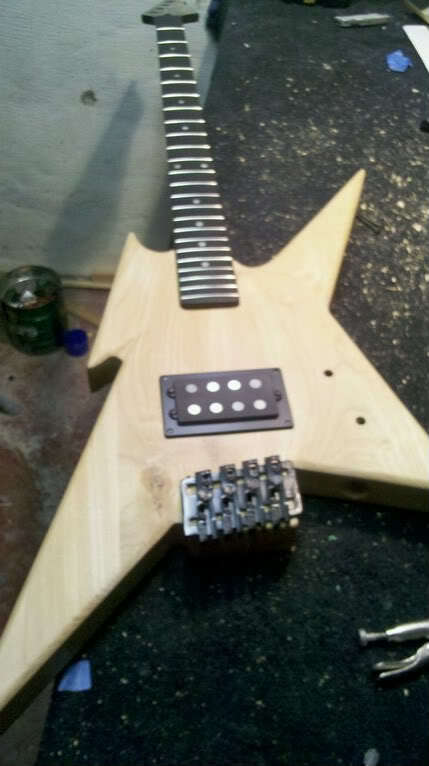 looks like a new ruff sanded neck ... wow! really nice! 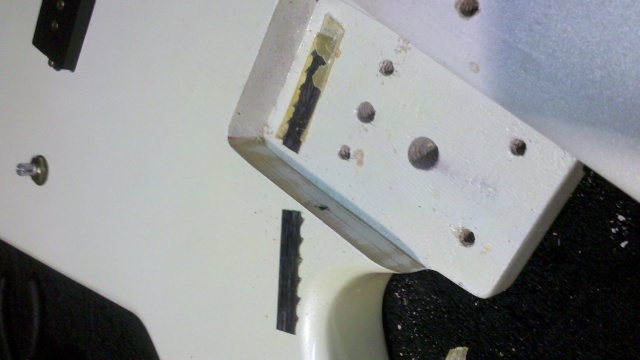 i didnt want to put any tension on the joint between the neck and fretboard before the glue had time to cure. i looked at the jar and it said 16 to 20 hours in 60% humidity ... it had been 24 hrs in 40% humidity. i couldnt help myself! i put 3 turns on the truss nut (with my fingers!) 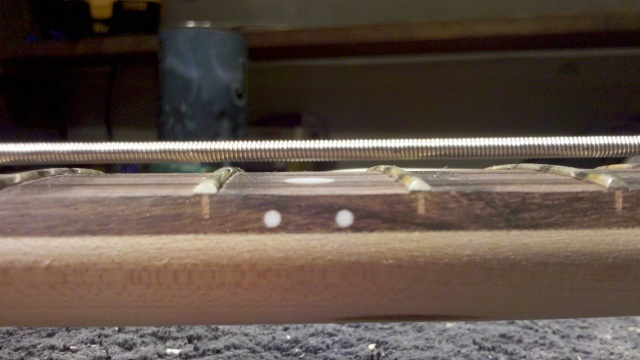 and it raised the 12th fret .08" ... woohoo! it works! i'll mount it on the bass tomorrow and test it with some string tension. i just need to tell you guys i'm excited about this. most musicians wouldnt try something like this. i was about ready to just scrap this neck. this is something most musicians would take to a luthier and the luthier would decide on how much value the musician had in the instrument to determine how much to OVER inflate the repair bill. this is another place where the word "vintage" gets abused. this neck is sorta irreplaceable ... so its "vintage". 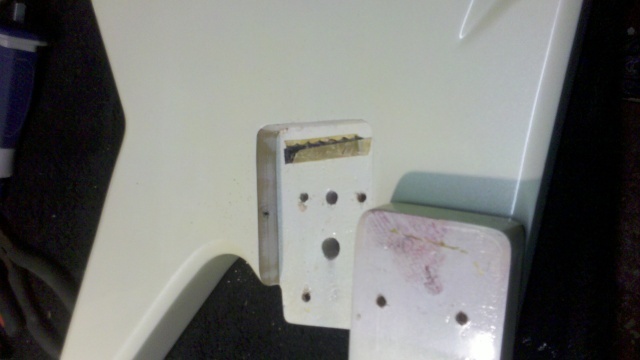 i wouldnt be surprised to get a $300 or $400 repair bill for something like this. .... its > $100 and 4 or 5 hours worth of work. so this is more of the mystery of luthierie and neck construction removed for me ... a year ago i would never even consider i could do such a repair. totally rad dude as the Canadians would say. glad it didnt turn into a "moneypit or firewood" choice instead . Fantastic job, Bro! Keep us posted! plays like a dream now. DUDE! That is TOO awesome for words! Great save! Mike had one high one causing buzz on his neck. This one has frets high and loose all over the place. I got a knife under one loose one and it piped right out. I think its time I bought some fretting specific tools; arbor press and crowning files. I used it on Sunday and even have a pic to prove it..
and i lowered the strings so low that both the g and d wont play the 13-14th at all and the d goes dead in .0005 secs. When I invest in the tools you can just send the neck back and ill level it for you. Your neck is only bad in that one spot ... shud be an easy fix. Thats really turning out nice. Great job. With the new tools, the fretwork came out nice. Without handing almost $200 to stumac all the frets are level, crowned and uniform. Its good to again have learned another thing. I stained the neck, fret board and all, ebony and will apply many coats of tongue oil finish on top. With many days of work repairing dings, holes and divits, I don't think this body is a good candidate for a dye, stain or trans finish ... not to mention its a multi piece body. Ide be alright with the multi piece, the grain is nice, but there will be too much other repair to make it work. So, its up to you guys ... I need to do a solid color finish. 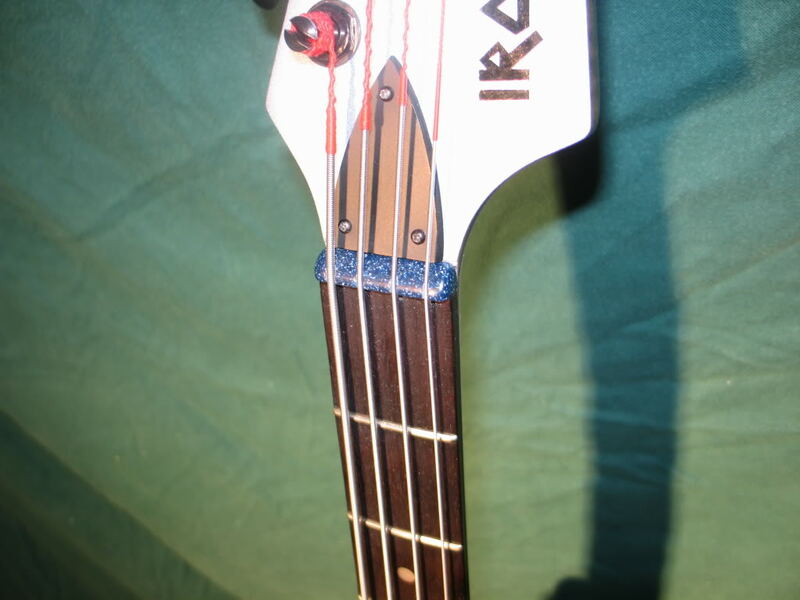 I liked the colorshif blue/purple I did on the washburn. Best I came up for this one was the colorshift green/red. But ... what do you guys want? I need some ideas. Ground rules ... its gotta be dark; no surfcaster teal or hot pink. 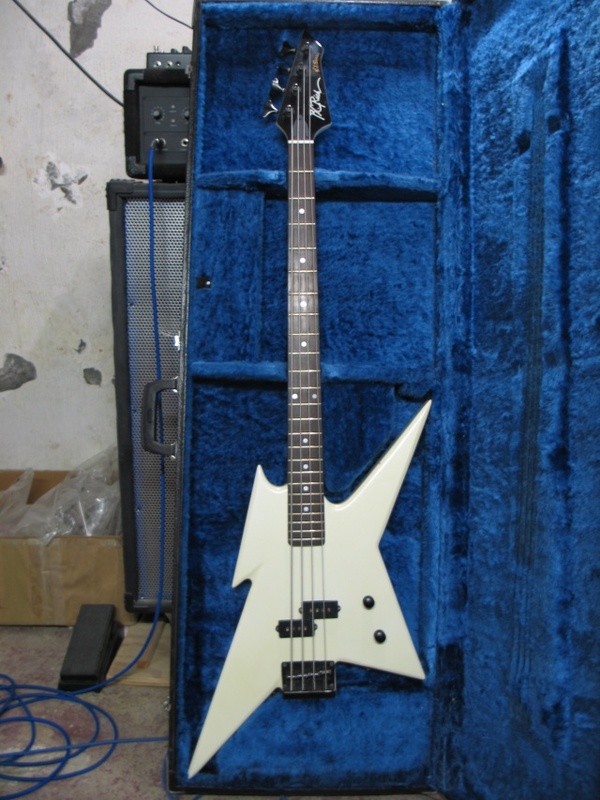 No stock bc rich colors ... this bass is unique, I wanna keep it that way. 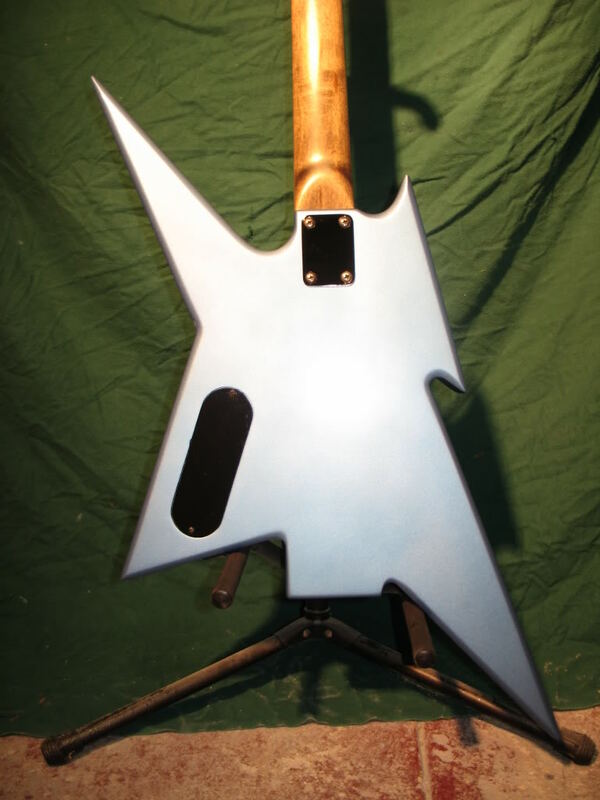 That's a bc rich stock color. No black, white or red. The crackle on that bass is awesome mike. I was thinking of doing the steelers ritter idea. I have a request in for info how to do crackle with a paint company. I was thinking of doing it like the gun metal flake yamaha. The candy red and candy blue layers are good ideas too. B- Dog's idea for colors is also tasty. I was kinda joking on the tri-color thing, but if you want it to be super unique, what else could say that but a multi-color unit? if i made something like that i believe i would never sell it. unless someone gave me a deposit to do so. well good luck on the crackle cause I'd buy it in a newyork minute if I saw a ironbird in black and yellow crackle..
Yeah well ... anyone who knows is keepin that secret. 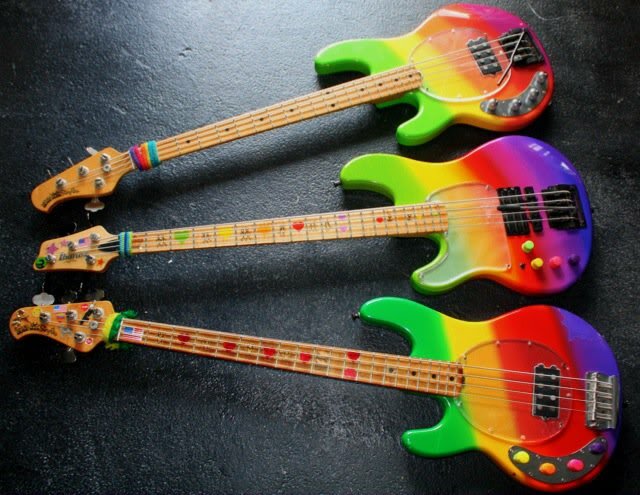 Any answers I got were elmers glue and arts and crafts latex tricks ... im not putting that on a bass. do it up like a Washburn with the rising sun pattern just not black and white? my guitar player suggested something like the shape of the body in, in, in, in, in. something like that. 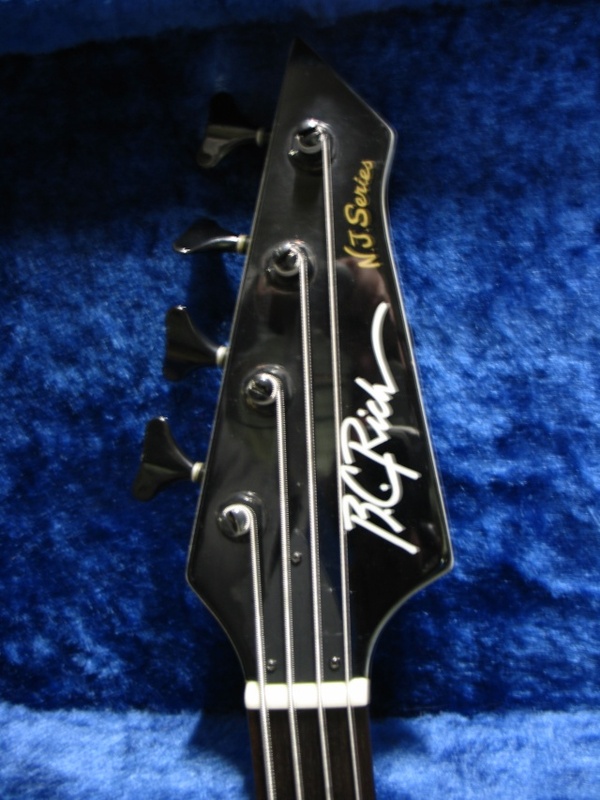 these rudy sarzo basses are pullin a pretty penny these days. i used to have a pic in my bucket of a red one that was on ebay and sold for 600 bucks. Yeah ... I think that's a lot for a used 80s washburn. I know when we spray Krylon Flat Black over a Finish really heavy you get a crackle finish. I know I have seen that paint at the craft store or even the hardware store. The rust o leum is aeresol spray lacquer! Now I just gotta find it and try it out on scrap. Last time I tried it you spray it on heavy, then it needs to dry fast for it to crack. hey Mike I wonder if this bird is in the same condition? 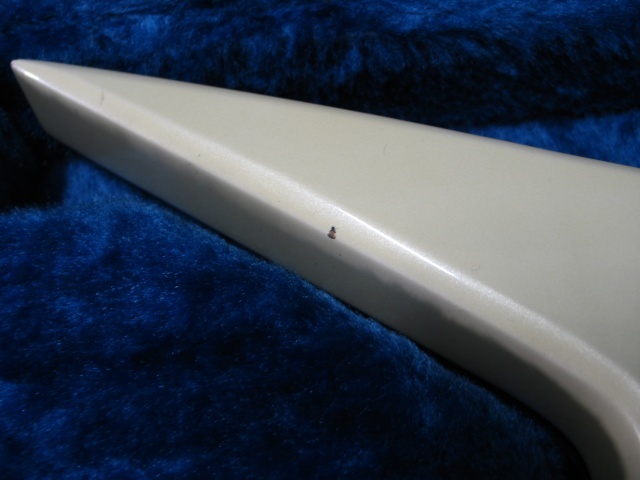 and is this the model with the longer tailpiece for a kahler? meaning f-ed TR, shimmed neck? 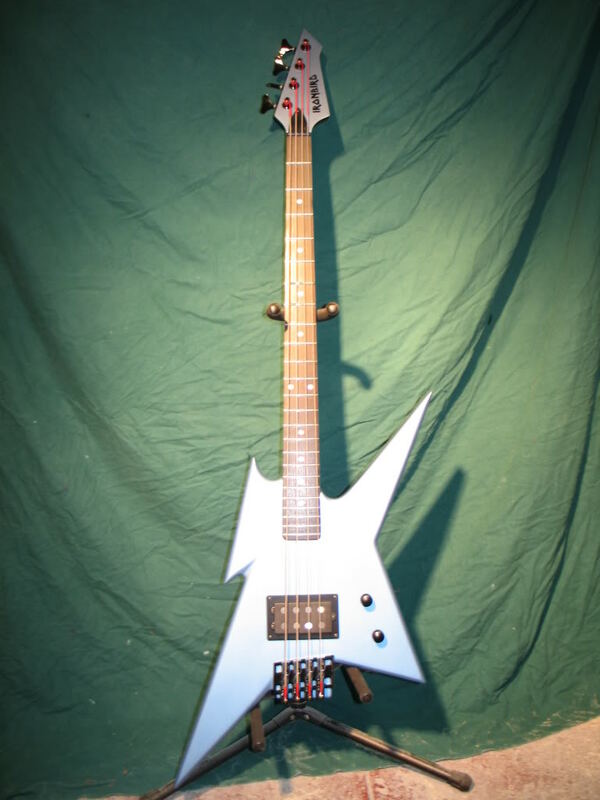 it is owned by one of the gang on the leftybass forum, and I'll bet he wants OVER 400 for it. after hearing of your disasters, I cant afford to buy it THEN send it out for repairs. Just from the picture, this thing looks in much better shape than the one I got. Mine had so many holes and dings in the body, im still working it out. Ill be ready for paint next week. Im going with phelam blue. Two things as far as the truss and neck. Look at the top point stiching back ... it tapers and curves back. I think this one is a newer model. Find out if it has the dual truss system available on the newer riches. If it is, then yeah, its worth $400. 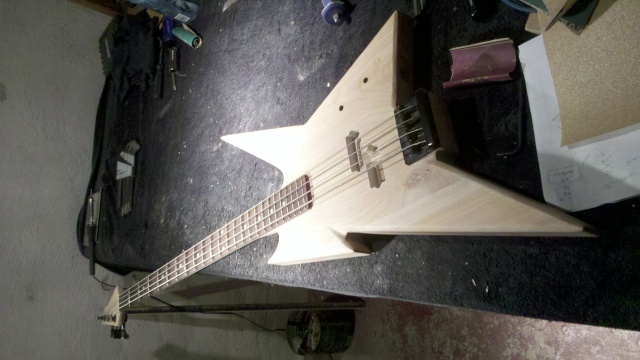 Remember, any bass you buy could have a stripped truss like that. All it takes is one knuckelhead who doesn't know what they are doing. And no, espically if this is a 90's or later model, its the shorter body style. The bird with the kahler was only available till 86. Those are nice dimarzios in it. thanks mike. 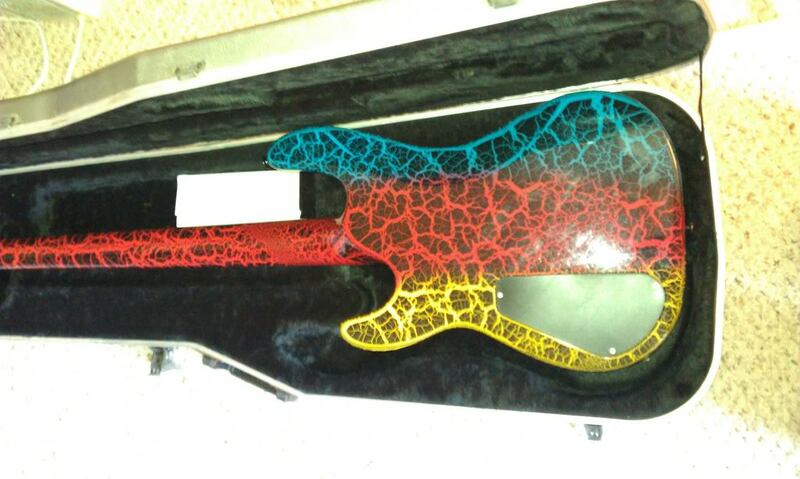 and if you get the hang of the crackle on a piece of wood and you wanna try on a bass body, let me know. either the champagne charvel or the C.A.R futura. all I have left in lefty is the series10 the Futura and the 2 Charvels. everything else is righty. i'm gonna start clear coating tonite (i hope). someone told me that pickup looks like a big domino. that's about the same color as that pbass it looks like. and i see my bridge came in handy. again ... its blue. chek out the swatch on the reranch page ... its actually lighter than that. it may darken up when i put the clear on it. but yes ... it does look the same. i think the flash got it. i didnt mount the bridge yet so i dont know if its gonna work ... but that would definitely be cool. if not, i'll eventually put it on the tarus. this is a super old thread. this bass was a nightmare. everything went wrong! but i finally got it done yesterday. using corian for nut material now ... works great! this was such a PI the A, i dont think i'm gonna sell it. ive never seen another bassist playing one except for benjamin orr from the cars ... so i guess that will make me the only one now. i like that. oh wow, the sparkle blue nut is actually fitting for the metallic blue paint. too bad you couldn't have found one lighter sparkle. the neck backside looks so dark like mahogany. and the kahler i gave you came in handy. You like blue naturally, but if you were redoing it for me I would have painted it red. throw it on ebay for 600 because you never know what bird fanatic will snag it up. if it sells you win, if you wanna keep it you win. The corian samples I used were direct from 3m, so there were only so many colors available. It sure beats off white bone, black graphite, brass or aluminum. 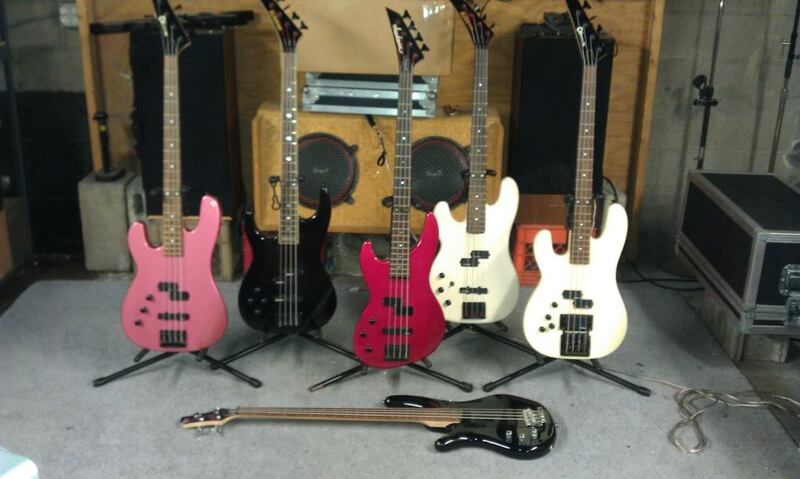 I promise mike, next solid color bass I do, ill do maroon or burghndy. Man, you do some amazing work, MadMike! Thanx eric. Yours is commin off the workbench next. 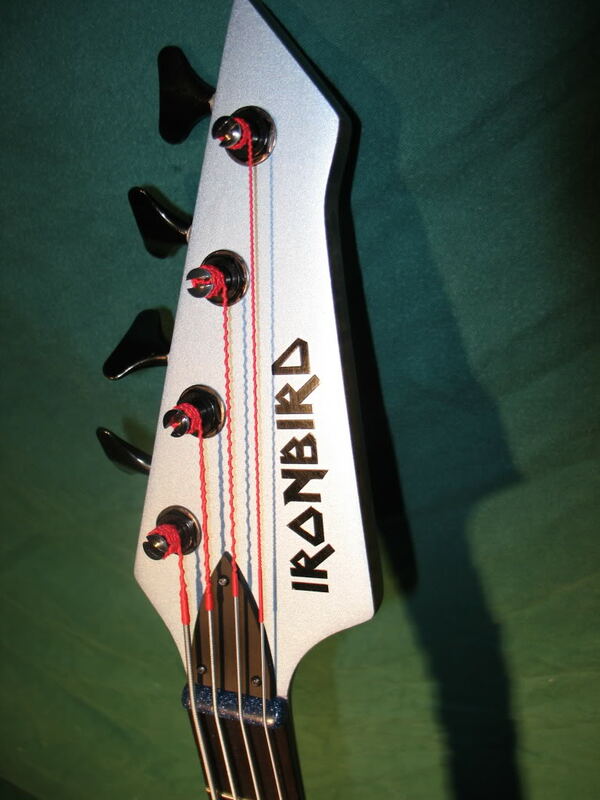 LOVE the headstock logo, bro! Listening to NOTB right now!! !